Included within the L.P. for Cover Plus were two stickers. One was an almost exact reproduction of the cover, the other is shown above (which probably appears larger than actual size on your computer). 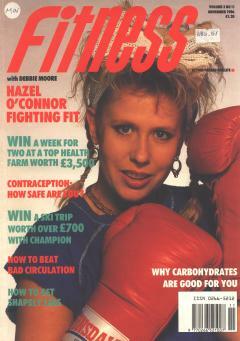 Also included within the L.P. for Cover Plus was information for joining the "Hazel O'Connor Fan Club." 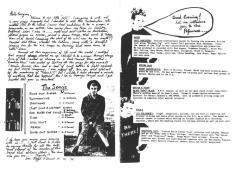 Started by Hazel and eventually run by her mother (Joyce, in Coventry), the bi-monthly newsletter covered all of Hazel's activities up until the last issue of Nov/Dec 1989 (as she had moved to Los Angeles). It was Hazel's way of directly connecting with her fans. 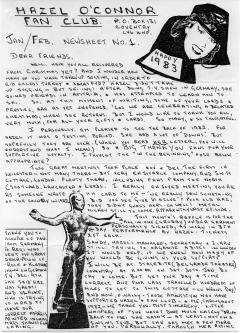 Above is the first page of a typical issue, handwritten by Joyce and then photocopied onto A4 size paper. Released at the same time as Cover Plus was Hazel's autobiography, "Uncovered Plus." Printed in hardcover and paperback (the paperback version is shown above) the book concerns most of the major events in O'Connor's life leading up to the recording of Cover Plus. Ms. O'Connor has been working on an updated autobiography. An advertisement for Jangles in the trade paper, Variety. The producers were selling the foreign (outside of the U.K.) broadcast rights at the Milan International Television Market (known as MIP). On the B side of Why Don't You Answer is "Radio On" which Hazel sings almost completely falsetto (and is virtually unrecognizable). This 45 rpm record was distributed by Ariola Eurodisc GmbH, catalog #106 933. For the TV series, Prospects, Hazel recorded 2 songs. On the A side was, "Today Could Be So Good" and on the B side was, "We Tried." This 45 rpm record was published by Red Bus Records (International) Ltd., catalog #RBUS 2209. It was pressed in England and marketed & distributed by Precision Records & Tapes Ltd. The 12 inch single, Fighting Back, was copyrighted and published by BBC Enterprises Ltd. in 1986 and manufactured and distributed by EMI records, catalog #12RSL 182. English rock stars always pop up in NME and The Face but how many end up on the cover of Fitness magazine? Here's Volume 3, Issue 11 of November 1986 (with an article inside) which was meant to coincide with the broadcast of Fighting Back. The Playhouse Theatre in London's West End is near the embankment of the Thames River. 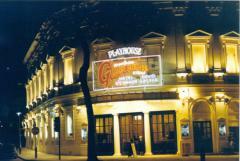 It had just been renovated prior to the opening of the second production of Girlfriends. Photo courtesy of Howard Goodall. For the legitimate musical Girlfriends a 45 rpm record was produced. 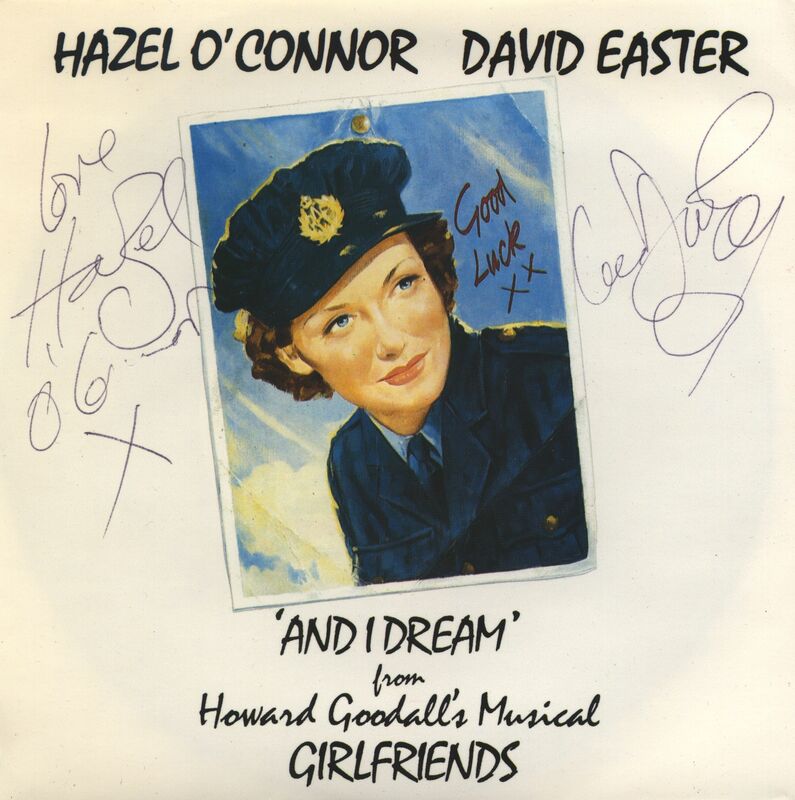 On the A side Hazel O'Connor and David Easter perform the duet, "And I Dream." On the B side Clare Burt sings, "Wake Me O Wake Me." The record was published by Exallshow Ltd. and distributed by First Night Records, catalog #Score 13. 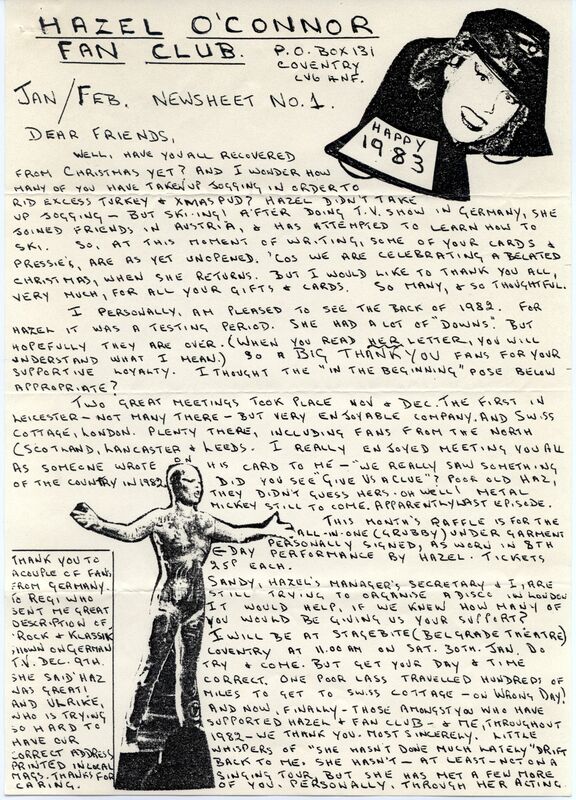 The inside of the program distributed at the club, "At My Place," in Santa Monica, California on Wednesday, March 15, 1989. 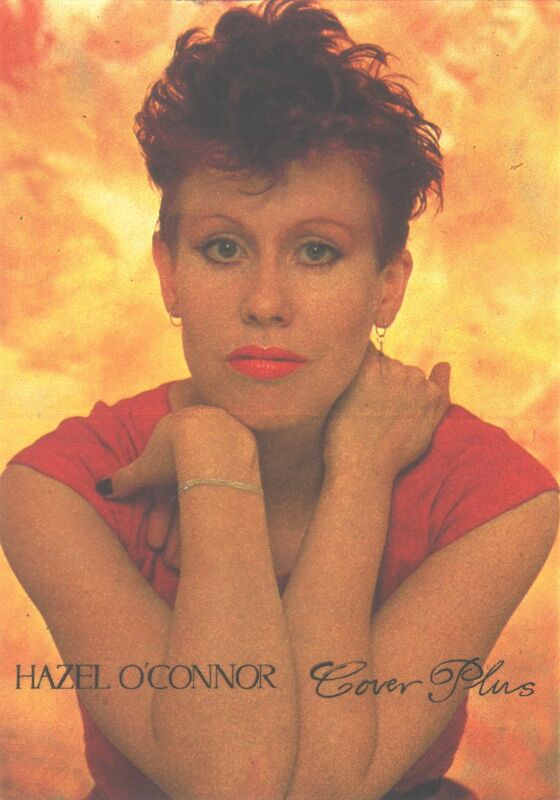 Hazel O'Connor is the internationally known songwriter/singer/actress. After a few bit parts as an actress (and a number of performances as a singer) O'Connor landed the starring role in the British feature, Breaking Glass (1980) which co-starred Phil Daniels and featured Jon Finch and Jonathan Pryce. In bit parts were Jim Broadbent and Richard Griffiths. UK television chat show host, Jonathan Ross, was an extra. O'Connor holds the distinction of being the first woman to write and perform all of the songs in a musical feature film. Brian Gibson wrote and directed, Davina Belling & Clive Parsons produced, Dodi Fayed was the executive producer (but credited as producer). Fayed was probably best known as Princess Diana's boyfriend who was killed in their car crash in Paris, France. Breaking Glass was the first film his Allied Stars production company financed; the second film was Chariots of Fire (1981). The movie was a sensation at the Cannes film festival and was purchased by Michael Eisner of Paramount Pictures for U.S./Canadian release. Paramount cut the ending from the film and after several festival & test screenings shelved the picture. Because of the lack of a theatrical run (in the U.S. and Canada) it enjoyed a hugely successful home video release. The feature immediately propelled Hazel into musical stardom. By the time Breaking Glass had been released in the U.K. "punk" was considered out of date and O'Connor, perhaps reluctantly, accepted the label of being "post punk"--when her music has never quite fit into any one genre. 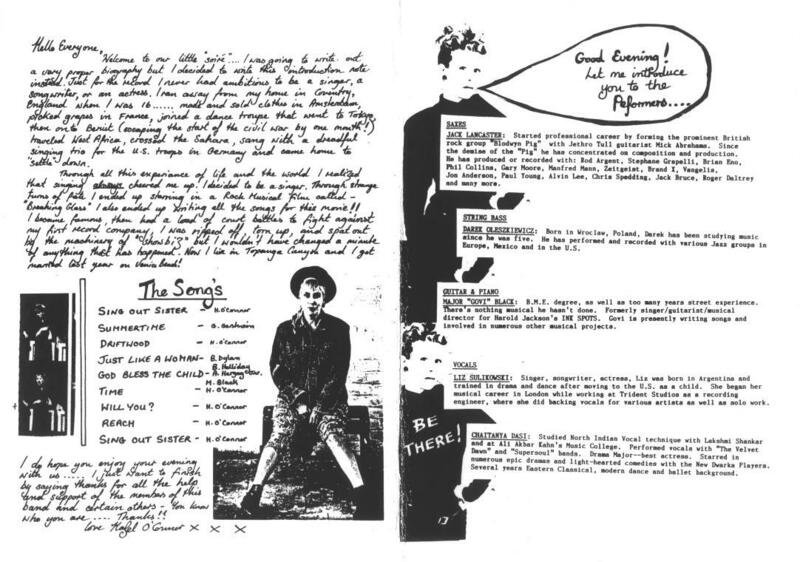 O'Connor's appearance on the U.K. television program, Top Of The Pops (on August 21, 1980 in her Breaking Glass/post-punk get up) inspired thousands of teenage girls to dress the same way that Fall in school. Her first professional tour featured Duran Duran as the opening act. Since most of the songs for Breaking Glass were written for the movie, Hazel was able to immediately follow up with an album of personal material she had been working on for years. Sons And Lovers (1980) is wonderfully pared down and personal. The album is very much about the lyrics and the minimum amount of instrumentation. Sons And Lovers was the complete opposite of Breaking Glass and what was to come next, Cover Plus. A very sad album but again deeply personal, Cover Plus (1981) has some terrific ballads, songs and (as always with Ms. O'Connor) anthems. As more than one music critic has joked, "...(Y)ou don't know if you're supposed to listen to her stuff or stand at attention." Next came Hazel's first television series with the starring role in, Jangles (1982), which was about a fictional teenage nightclub. Only 7 episodes of the half-hour U.K. show were produced. While Hazel was well received, the series was not. A 45 of two of the songs from the series was released. Alex Kirby and Ken Price directed, Peter Holmans produced and Patrick Dromgole was the executive producer. One of the writers, Bob Baker, had worked on Dr. Who (1969) where he co-created the robot dog K-9. After Jangles he would go on to write (among other productions) the 2 Aardman Animation shorts, Wallace & Gromit: The Wrong Trousers (1993) and Wallace & Gromit: A Close Shave (1995). Ms. O'Connor returned to the recording studio and came back with the very different sounding album, Smile (1984). While appreciating all the work that her brother Neil and Martin Rushent put in as co-producers, this was probably the one album that she disliked the most. They had produced what Hazel always ran away from--a heavily orchestrated, dense track that you can sometimes dance to. Some fans loved it instantly and others (like Ms. O'Connor herself) have come to like it later. In Hungary (a country where she has always been popular), Ms. O'Connor was a guest of the band KFT for a live, premiere performance of their co-written song, Stranger In A Strange Land (1985). The result was a single that holds the distinction of being one of the hardest Hazel O'Connor records to obtain. 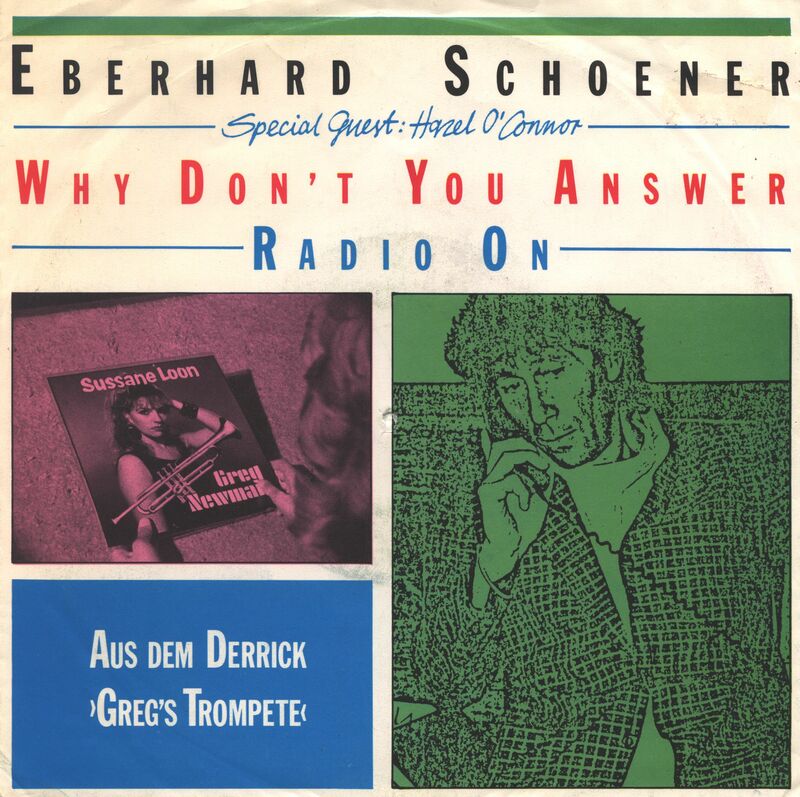 Another country that's always liked Hazel is Germany, where musician Eberhard Schoener asked her to provide the dialogue and vocals for Why Don't You Answer (1985). The song is all about (Hazel) trying to reach someone on a phone. And with Chris Thompson (best known for the single, "Blinded By The Light") they together contributed the tune "Push And Shove" for the fund raising 12 inch album, Greenpeace (1985). The single and music video were used to promote the album. During this same period, in front of the cameras, O'Connor had a supporting role in the Julie Walters feature, Car Trouble (1985) and then came a guest spot in an episode of Prospects (1986) which ran for only one season on Channel Four. The comedy series centered on 2 perpetually unemployed East Enders (Brian Bovell & Gary Olsen) whose, "Prospects are lookin' up!" Linda Agran and Johnny Goodman executive produced the 12 one hour episodes for Thames Television/Euston Films. O'Connor wrote and performed 2 songs for the series which were released on the 45 rpm, Today Could Be So Good. Next came the starring role in the limited series, Fighting Back (1986). The 5 one hour episodes (all written by Gareth Jones) concern a single mom (Hazel) trying to raise her kids in her home town. Paul Seed directed and Chris Parr produced the BBC series. 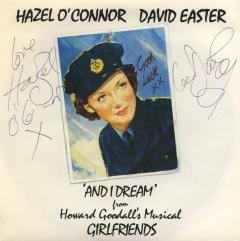 Hazel also wrote, sang and co-produced the opening title for Fighting Back. O'Connor worked for the first time with a gospel choir and layers of voices which would later figure predominantly in her music. She also made an appearance (as Hazel O'Connor!) in the BBC comedy TV series, Alas Smith & Jones (1986) starring Mel Smith and Griff Rhys Jones. The series title was a pun of the U.S. television western series (Alias Smith and Jones [1971-1973]). Her first professional, legitimate musical was in the starring role of Phyllis in Girlfriends (premiere October 16, 1987). The music and lyrics were written by Howard Goodall (best known for creating the themes of Mr. Bean and Blackadder). The musical concerns the all-female, British, World War II, Woman's Auxiliary Air Force (WAAF) which took over many of the ground crew positions to free up as many men as possible for air combat. To prepare for their roles, all of the female stars were trained in military etiquette by an RAF drill sergeant (Michael Austen). Girlfriends was the first production to re-open the Playhouse in the West End of London. It had been dark for 40 years. A cast album was not produced but a single was recorded for airplay to help promote the opening of the production. The single was also on sale at the theatre. Hazel was then invited to act in a television series. She moved to Los Angeles on April 30, 1988--wanting to see if she could "make a go of it" in Hollywood and/or the American music business. To no great surprise, O'Connor discovered that the series had been canceled (due to a strike) but decided to stay to further enjoy sunny Southern California. But she was virtually unknown in the United States since her movie and television productions had hardly been distributed there. Hazel was much better known in the music industry where she found plenty of support towards mounting different shows, bands and performances. Amazingly, almost all of this period in her life was covered in the 27 minute documentary, Live And Kicking In L.A.. Filming started almost immediately upon her arrival on May 3, 1988 and (what had started out as home movies) continued almost right up until the final cut on May 27, 1990. Most of the short was shot and produced by David Koenigsberg who would go on later to produce The Soul Patrol. Hazel became the co-producer (and mercilous editor) when she decided to finish the film herself. Easily one of the highlights in the documentary is her marriage to Kurt Bippert, a fellow Hare Krishna disciple, artist, set designer and back-up singer in her band. They set about making a new home in a caravan park in the wilds of Topanga Canyon. Hazel even took on a day job but could never stop writing and performing her music. For health reasons, Hazel and Kurt left California and returned to Europe, eventually settling in the foothills of the Wicklow mountains in Ireland. Their marriage, always a bit rocky, did not last and they eventually separated. For Hazel, those last few years were heartbreaking in ways one would not expect. She had taken the opportunity to seek a normal, happy life and found that it eluded her. O'Connor accepted her fate and went back into the trenches of the world she had left behind. But her California diversion was not without its accomplishments and seeds for the future. During this time she wrote and recorded a demo album to convince record companies to finance a finished, studio recording. The album was recorded with a live feel to it to make up for the lack of a studio and proper mix. Copies of Alive And Kicking In L.A. (1990) were given to all the major & minor record labels. Financing never came forth but bootleg copies did. The unfinished work has repeatedly popped up over the years (and always with a new title)! To Be Freed - (1993) Studio versions of new songs plus a new version of an old song. Live... Over The Moon - (1993) Live versions of new songs (some of which were on To Be Freed) and of old songs. O'Connor was eager to re-record her old songs since after years of lawsuits and litigation she finally got back the rights (but not the recordings) from Albion Records (which was still finding ways of releasing them and evading royalties). One such evasion might have been through the album, See The Writing On The Wall (1993) which is a collection of 12 inch singles and B sides. Although by this time defunct, Albion still claimed publishing rights but the album was copyrighted by the (dummy?) company which bought their catalogue, Line Music GmbH. Another problem, but fairly new, was CD bootlegs. In a true sign of success, Hazel was now becoming an international cult star with pirated copies of her work quietly springing up around the globe. Before the release of To Be Freed was the single My Friend Jack (1993). She wrote and first performed this song back in Los Angeles. 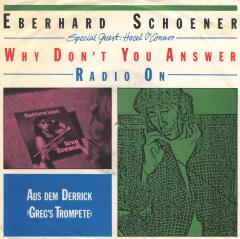 The single (and the album) were released by the German label, Columbia GmbH. The parent company, Sony, paid for a music video of the single to be produced. And if the previous albums were Hazel O'Connor samplers, the next was completely original and the most thematic since Smile some ten years earlier. While in Berlin she recorded the single, Refugees of Love (1995) in German. A year later (but not released until the following year) came Live In Berlin (1996) which was a recording of a live gig. Back in English, the single Na Na Na (1997) heralded the upcoming studio album, 5 In The Morning (1997) with all new songs. It was during this time that she was able to write and produce her own modest stage show, Beyond The Breaking Glass (premiere 1998). Originally entitled Beyond The Broken Glass (but changed for better recognition), the musical presentation is an autobiographical work criss-crossing through her life, the entertainment business and the world around us. Although Hazel covers some of the same ground as in her albums (such as Private Wars), the albums remain abstract while the show is literal. And here's where being an international cult star has its drawbacks; with a decentralized fan base she needed to be able to mount a show that could travel anywhere in the world without going broke. She found the answer by limiting the instruments to only one, and one of the most unlikely of instruments for contemporary music, the seldom-used (and therefore novel) Irish Harp. Does she sing traditional Irish tunes(? ), yes, but also her rhythm and blues as well as songs in a style which caused one friend to exclaim to her, "You've turned Black Hazel!" It's quite a mix but it works. Most people don't even notice the juxtaposition but reviewers have loved it. Working and performing with celebrated Irish Harpist Cormac De Barra, the premiere was at the Edinburgh Fringe (of the Edinburgh International Festival) in 1998. They returned to Edinburgh in 2000 for a 2 week run at the Claremont Bar and have since performed the show at numerous festivals and venues throughout the world. As a direct result of the success of the stage show, a soundtrack album was produced. Beyond The Breaking Glass (2000 and re-released in 2002) contains the songs but not the monologues from the show. Additional musicians were brought in for the recording (and they have sometimes joined in with Hazel and Cormac when a live show is peformed). Starting in 1999 and continuing off and on until January of 2001, Hazel recorded (in Los Angeles) her co-starring role in the radio drama series, The Soul Patrol. The part of Holly Violet ("violet" being another color like "hazel") was written expressly for her. It was not the first time she had performed voiceover work; U.K. fans might recall her doing commercials for London Transport some years earlier. Acoustically Yours (2002) was a live album of all acoustic performances recorded in the Berlin nightclub, Quazimodo. Ignite (2002) holds the distinction of being the first album where Hazel was a guest performer (and not just on one track but on every track). A Singular Collection: the best of Hazel O'Connor (2003) has most (but not all) of the hard-to-find singles released over the years. It's one of the most interesting albums to listen to as one zig zags through decades and many different musical styles. In 2004, The Subterraneans (a UK rock band formed in 1998) became Hazel's part time, live, back-up band. When possible, they performed many gigs together. One such performance in Brighton was shot as a DVD entitled, Eighth Day (2005). A double album of the same concert, Fighting Back (2005) was released later. Also in 2004 they gave a memorable performance at the world famous Glastonbury Festival. Moya Brennan sings on the song, "Hidden." Brennan is the voice of the Irish roots band, Clannad. Tony Dangerfield sings on the song, "If Only." Dangerfield is the lead singer of The Subterraneans. Rob Reynolds sings on the song, "Tell Me Why." Reynolds is best known for his album, Sightseeing. Hidden Heart couldn't be more different from Smile and yet has the same strong convictions. Instead of a marching band feel there are now choirs; instead of a techno dance beat there is now a Celtic/African drum section. Unmistakably Irish in its roots, the theme is still very much about Hazel coming to grips with sadness and rejection via different forms of personal strength. (Even the love songs are in the past tense.) After all she's been through she still doesn't sing about giving up (which is perfectly encapsulated in the fittingly, final song, "Fear Of Flying"). In anticpation of the release of Hidden Hearts, Hazel (backed up by The Subterraneans) performed on the ITV series, Hit Me Baby 1 More Time on April 23, 2005. Hazel O'Connor today lives in County Wicklow, Ireland with her 2 dogs. This page was last modified on Tuesday, June 24, 2014.